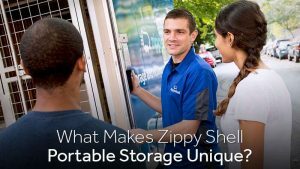 Home / What Makes Zippy Shell Portable Storage Unique? There may be dozens of different storage solutions available today, but none of them quite compare to Zippy Shell. This portable storage solution works for long distance relocation, across town moving, basic reorganization and protection of your belongings during a renovation. Find out what makes this storage solution unique in its field to determine if it’s the right choice for you. Military orientated storage, which involves long-term storage at affordable rates and flexible delivery dates. Realty storage, which gives you more access to your furnishings as you live through an Open House phase. Commercial storage solutions, which can be tailored to maintain electronics, paper documents and other delicate materials. Residential storage, in all sizes and for both long and short-term periods. Student storage, a special ZippyU program offering low-cost summer storage that students can share for even greater savings. With service packages already tailored to the most common types of customers we serve, we make it easy to get the exact amount and type of storage you need without a lot of negotiation and planning. Speaking of flexibility, Zippy Shell is particularly good at adjusting to unusual schedules. Are you a traveling freelance photographer who won’t know they’re coming home until a week before you arrive? We can get your belongings out of storage and back at your curbside within a few days notice. Need your belongings cleared away in 48 hours so you can take advantage of an amazing job opportunity? We’re ready to help with anything you need. Most portable storage companies require you to have a paved driveway with plenty of width to accommodate the delivery of their storage unit. Unlike these other designs, the Zippy Shell moving unit is street legal and can be parked curbside like any compact car. It takes up only the same space as a friend visiting and parking on the street. You can keep your driveway open and free and avoid any citations or tickets for blocking up traffic. Finally, remember that portable storage units are inherently more secure because they’re parked in an enclosed facility with no outside access. Other storage systems are designed for the public to access directly, creating a big security weakness that can be exploited despite the best access codes and live monitoring. Ready to store? 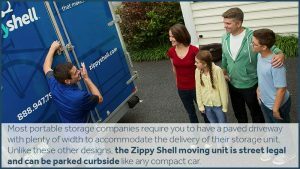 Contact us at Zippy Shell Greater Columbus today to get a free quote and find out how our storage system can work for your specific organizational or moving needs.